If you have a severely damaged or infected tooth, do not have it removed. Bell Dental can save it with root canal therapy in Louisville. Although they have a bad reputation for being painful, new advancements in dentistry make them no worse than a traditional filling. Using the latest methods, we will rehabilitate the health of your tooth to save your smile. 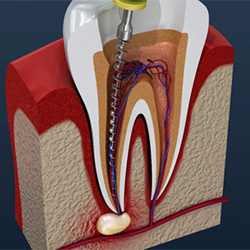 A root canal is an endodontic procedure that removes the inner most layer of your tooth, known as the pulp. Although the pulp is necessary while your tooth is still developing, it can survive without it after it is fully formed. The procedure involves removing the areas of decay and damage prior to extracting the pulp through the crown. Your tooth is sterilized and sealed using a material called gutta-percha. Now that its health is restored, we improve its function and appearance by placing a custom-made crown over the tooth. It is crafted to meet your exact size, shape, and color needs to look and feel natural. When a tooth is compromised by decay or infection, the easy answer may appear to just have it pulled. 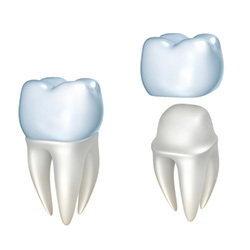 While this provides a quick fix, it leads to new complications due to the missing tooth. To fill the empty space and to protect your oral health, you will need to make a lifelong commitment to a dental prosthetic, like a bridge. 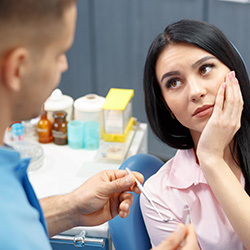 Although it may be tempting to put your root canal on hold, it is never a good idea. The longer you wait, the more damage that will occur. If too much time passes, we may not be able to save your tooth. Your teeth have 3 layers. 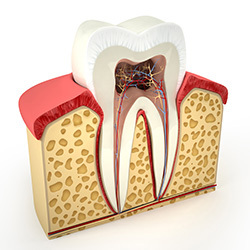 The hard outer layer you see is the enamel, which protects the dentin. The dentin contains tiny tubes that connect to the inner layer known as the pulp. When you consume sugary foods and drinks, it combines with your saliva to create an acid. As it sits on your teeth, it eats away at your enamel until a small hole forms, known as a cavity. At this point, it can be treated with a filling; however, if you delay care, it will progress until it extends beyond the dentin to infect the pulp. After the pulp is affected, it leads to many painful complications, which can only be stopped with a root canal. Tenderness when placing pressure on the tooth. Lingering sensitivity to hot or cold foods and drinks. A pimple-like bump appearing on the gum near the tooth. If you have a damaged tooth, do not have it pulled. Bell Dental will save your smile. Contact our office today to schedule your consultation for a root canal.